Like most people, the two-car garage behind our house has become quite the mess over the years. 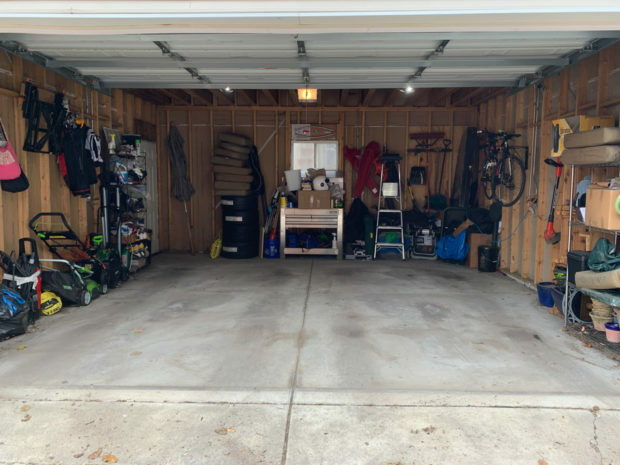 Between the accumulation of things that don’t belong in the house or our cars, and the daily wear and tear of vehicles dripping fluids onto the concrete floor, it’s not exactly a showplace. Plus, the simple act of moving two cars in and out and being able to open their doors without banging into anything has been a challenge. 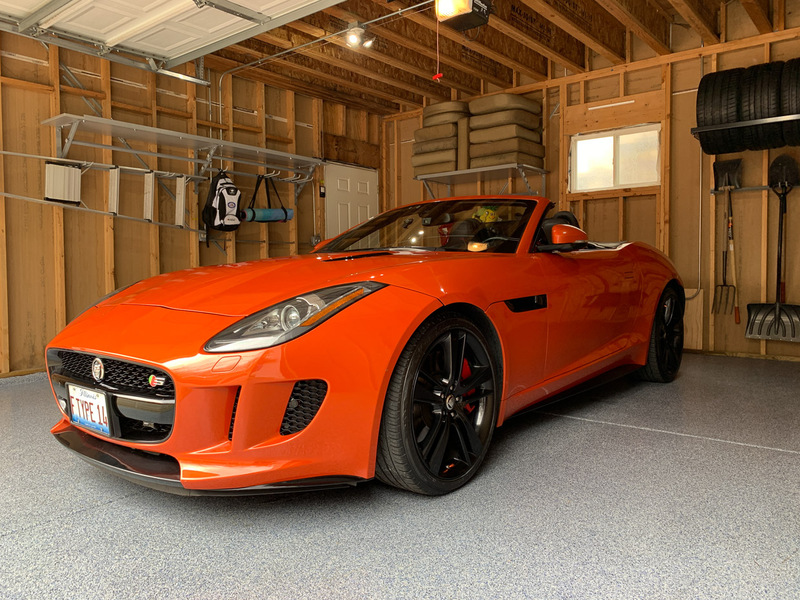 So when Chicago area garage renovators White Rabbit offered to help give our garage a makeover, I jumped at the chance. 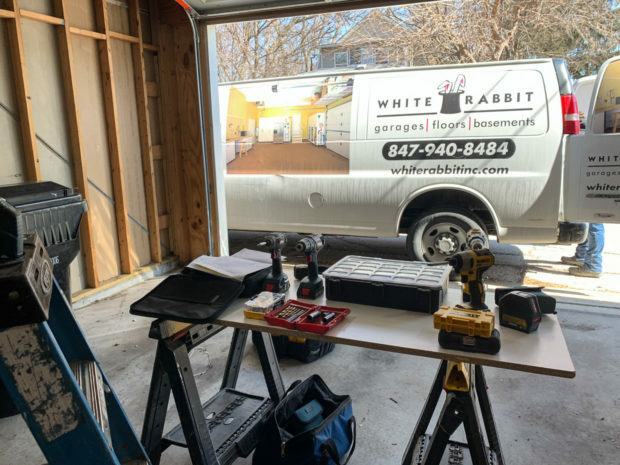 White Rabbit specializes in two main areas – flooring and storage systems. In addition to garages, they can also install these in basements or commercial spaces, like offices, firehouses, warehouses, and more. 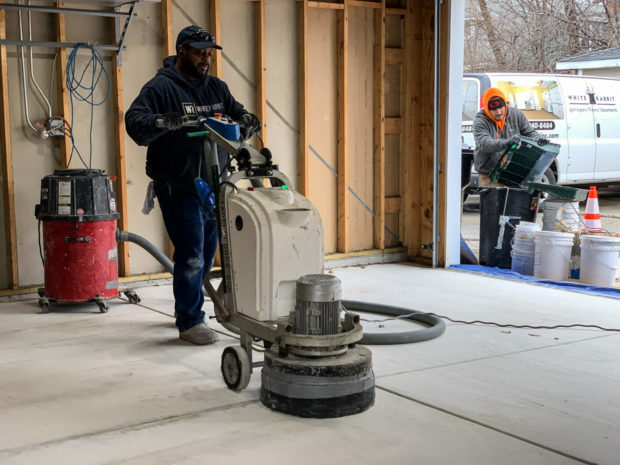 The company can take a beat up concrete floor and cover it with a durable, hard-wearing floor that cleans up in a jiffy and won’t absorb spills, while offering traction underfoot. In addition, their storage solutions can get items up off the floor, away from vehicles, and help open up space. In the case of our garage, we decided to go with two major upgrades – a new floor, and a few new storage units. White Rabbit is the exclusive distributor in the Chicagoland area for Monkey Bars, who manufactures a smartly-designed storage system which can be installed quickly, but provides tremendous versatility and utility. A typical Monkey Bars unit features a pair of angle braces, along with a pair of heavy duty metal bars which can be adjusted to one of a number of preset positions, allowing objects to be staggered, but still close to the wall. Sitting atop the structure is a metal shelf, providing storage space for bins, boxes, and other items you don’t need every day. 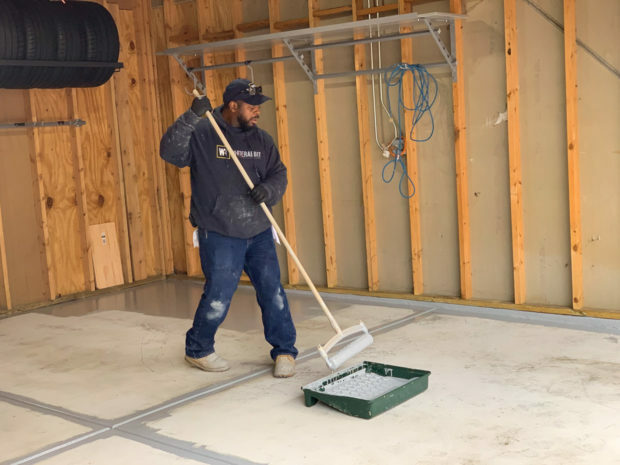 The units are super durable, and capable of holding up to 1000 pounds for every 4-foot section when professionally installed. 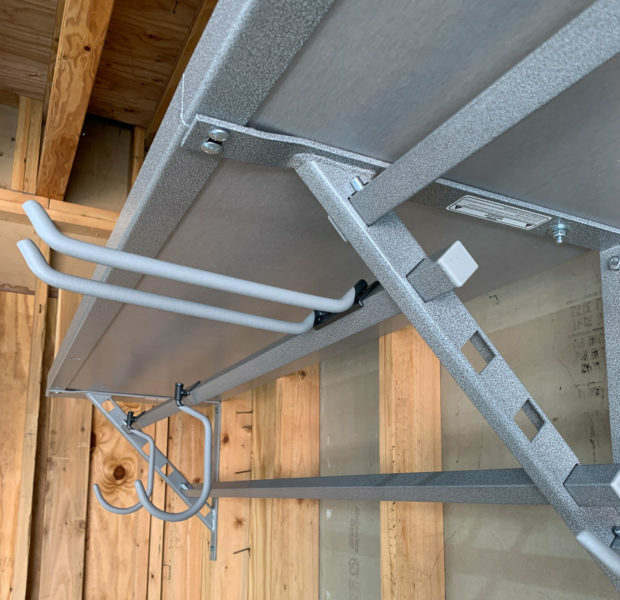 Monkey Bars makes a bunch of different kinds of hooks which attach to the bars so you can customize them to your specific needs, allowing you to hang just about anything. They also make vertical shelves which can hang from them, and also offer more traditional storage cabinetry that can be custom fit to your garage or workspace. White Rabbit’s professional installers took just a couple of hours to mount 24 linear feet of Monkey Bars around the perimeter of my garage. They need to be installed directly into the studs in order to bear weight, and this can be done with or without drywall in place. 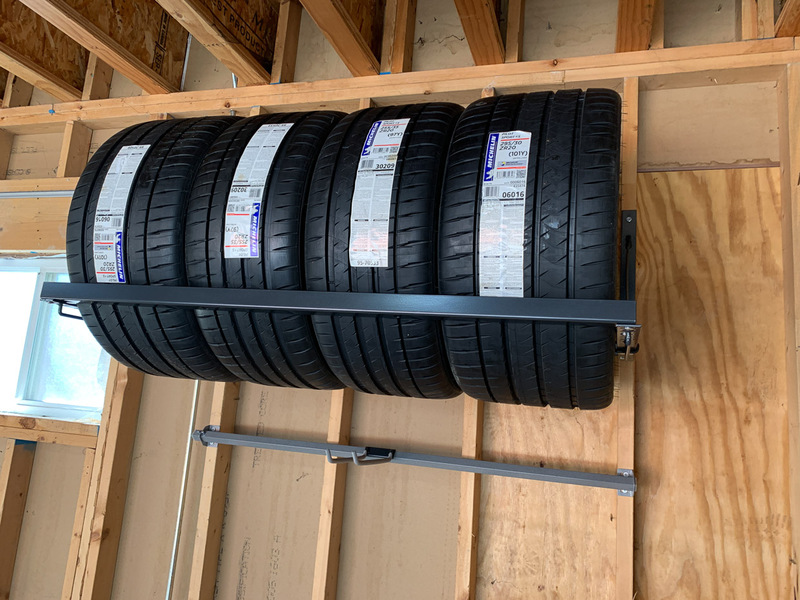 Being a gearhead, I have summer and winter tires for my car, so I always have a spare set floating around. Now, thanks to the tire storage unit they installed, I’ve got four spare tires at the ready – without taking up floor or shelf space. After all of the shelving was up, another crew turned up to redo our floors. The underlying floors in our 12 year-old garage actually weren’t in bad shape – they were mostly just stained with oil and other fluids from over the years. 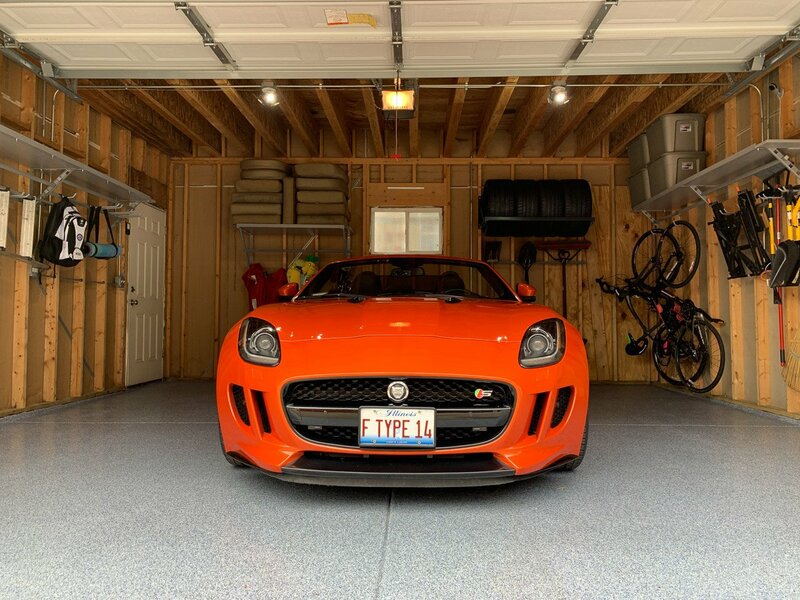 Unless you have a really large garage, preparation and application is a one-day process. White Rabbit can repair most cracks and spalling before installation, but if your floor needs to be re-graded, you’ll need to have it done first before the new coating goes in. Unlike other companies that use epoxy to cover concrete floors, White Rabbit uses Citadel polyurea coating, which is more durable than epoxy, has a bit more “give” to prevent cracking, is slip-resistant, and has a UV-resistant top coating. The installation process starts out with a thorough cleaning of the floor to remove debris, and then the crew gets to work with a high-speed diamond grinder to remove any imperfections, and to provide an ideal surface for the floor to stick to. Once prepped, the base coating layer is applied to the floor. This neutral base adheres to the concrete and will soon harden for extreme durability. 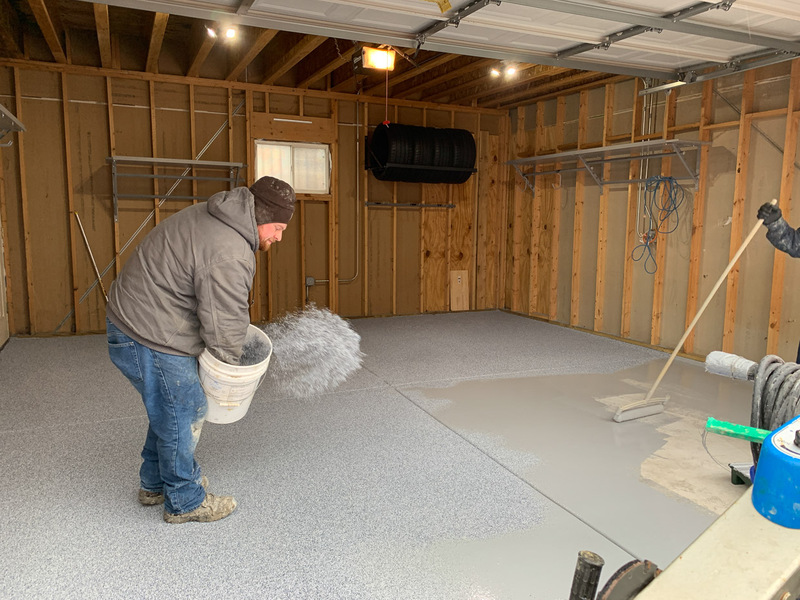 Before the base coat has a chance to set, another installer has the fun task of tossing colorful, textured aggregate chips onto it, much like sprinkling glitter into glue. 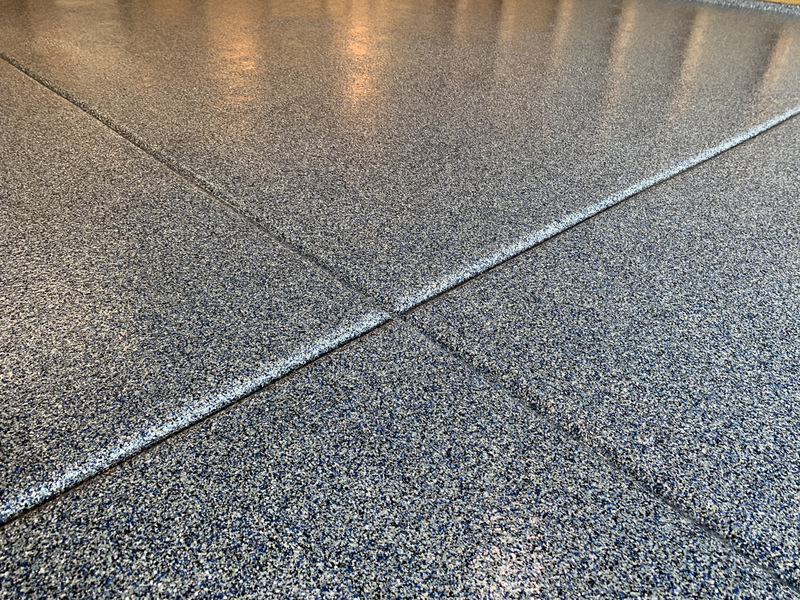 You can order your floor in one of a number of colors, so you can match it to your decor, your vehicles, or even your favorite college team’s colors. After that all has a chance to set for an hour or so, any excess chips are swept up, leaving behind a colorful, but as yet unsealed floor. A clear and glossy sealant coat gets rolled on at this point, which is the last step in the process before curing. After about 10 hours (assuming dry conditions), the floor is set enough to walk on, and after 24 hours, you can park cars on it again. 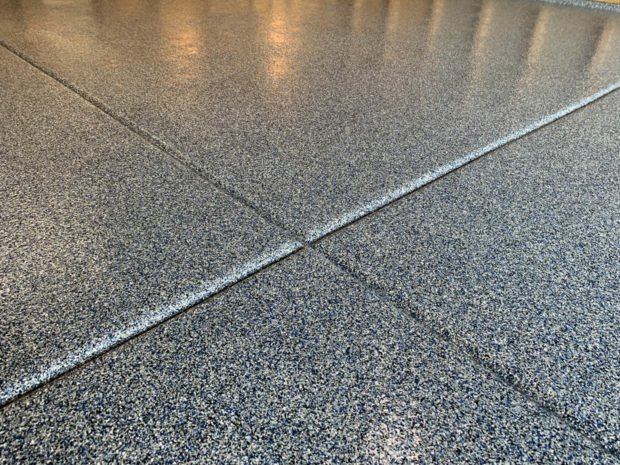 From this point forward, the floor is as durable as it can get, and can handle extreme weather conditions, foot and vehicle traffic, dropped items, and more. What’s especially cool about the surface is just how easily it cleans up. Spilled some oil? No problem, just wipe it away. In typical usage, you might get some condensation or water drips from your car’s air conditioning on top of it, and you can just squeegee that out of your garage door. Plus, the aggregate chips offer a slight grippy texture, so you won’t slip on this stuff like you can on an epoxy floor. Once everything was cured and ready for use, I was able to start putting all of our items back in the garage, and the result is fantastic. The Monkey Bars system let us get all the stuff that had been on the floor, leaning against the walls, and stacked on bookshelves up off the floor and away from our cars. 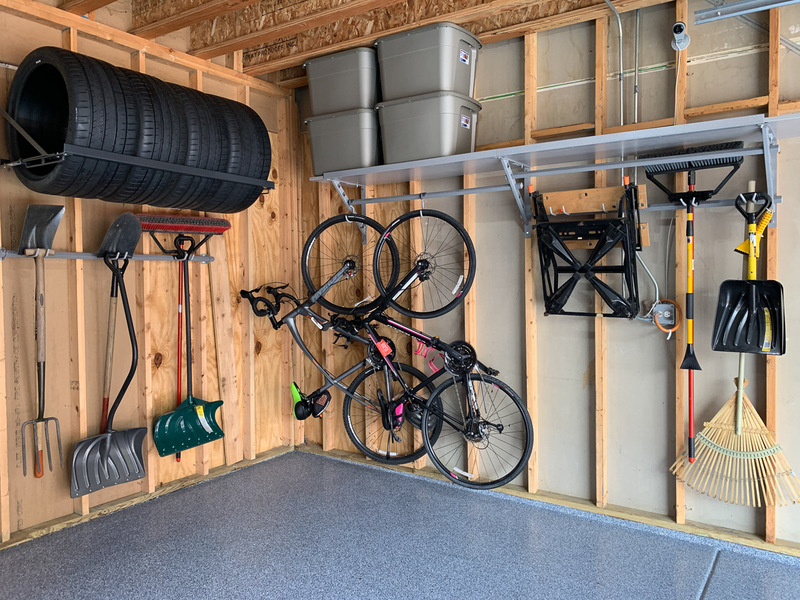 Certainly, the exercise of clearing the garage for the work encouraged us to go a little Marie Kondo on the stuff in there, but after we pared back to the things we really wanted to keep, the place looks pristine. Bikes are up off the floor, Xmas ornaments, patio furniture cushions, and spare tires are up above for long-term storage, and tools, garden supplies, and golf clubs are at an easy height for quick access. And we have lots of space left as we start to move some items from our basement out to the garage now too. I can’t say enough good things about the guys at White Rabbit. 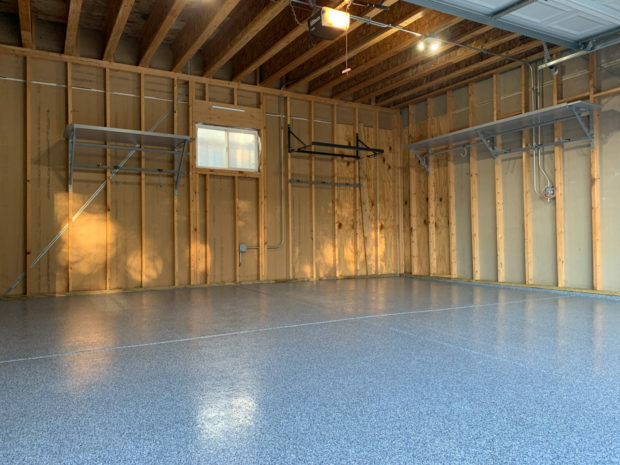 They did a great job planning out our garage project, showed up when they said they would, and the installers were efficient, professional, and pleasant to work with. If you’re in the Chicagoland area, I definitely recommend checking out their website, or giving them a call at 847-272-7878 for more information. Disclaimer: White Rabbit covered a portion of the cost for this project. All views and opinions expressed here are those of 95Octane and Awesomer Media.